You only have a day and a half left in this $100 off sale for the 32GB Moto X straight from Motorola with no contract. 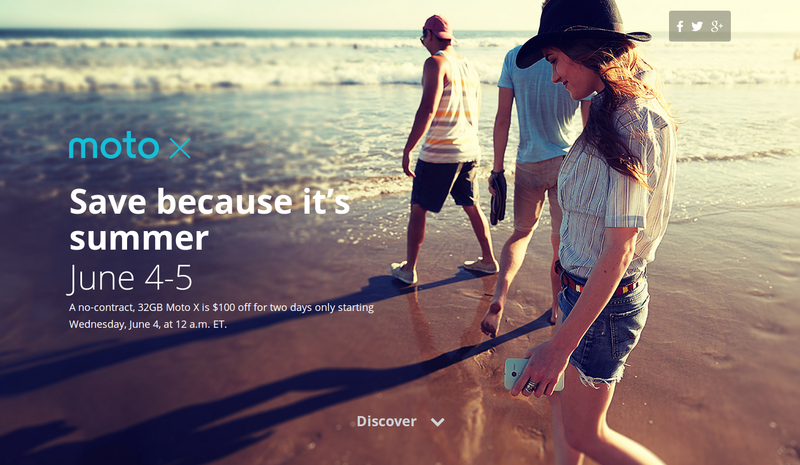 June 4th and 5th only, Motorola is holding a 'just because it's summer' flash sale. Of course, I think they are just clearing space to bring in their new rumored X+1, but that does not stop this from being a pretty good deal on a great device. Hit the Motorola website to check out the deal U.S. only, sorry. Or head over to my post on Android Authority if you want the rundown on the device itself. At nearly a year old, the Moto X still sets standards for what a Google owned Motorola device should be. That said, Lenovo will be taking over the reigns soon, leaving us uncertain what the future of Motorola devices looks like. Don't worry about the Lenovo take over just yet, the line of Moto devices, including the X, rumored X+1, Moto G, the new Moto G LTE and the Moto E are all as thoroughbred Google/Motorola as can be. I best not keep you any longer, I know you are busy comparing the Moto X to the $50 Moto G that is on sale right now too. I can tell you that the Moto G has been a spectacular device for me, it is not a powerhouse, but it is as solid as anything out there, and almost as fast. What do you think, is it worth grabbing a Moto G or Moto X right now, or should we just be holding off for the next big thing?